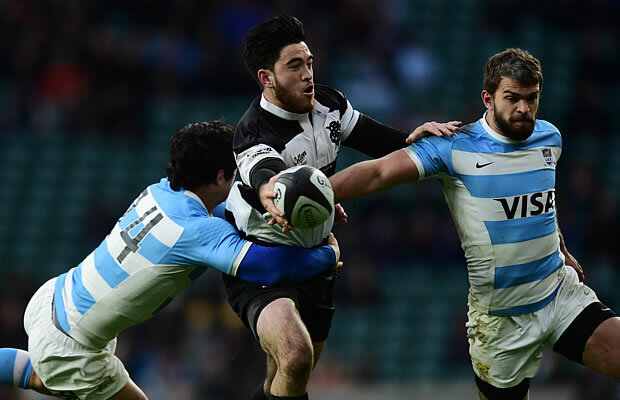 Argentina beat a Barbarians team filled with World Cup winners and Test stars 31-49 in a one-off Killik Cup match at Twickenham on Saturday afternoon. The Barbarians line up was coach by Australia’s Michael Cheika and featured several stars from the 2015 World Cup winning All Black side as well as former Springboks who won the world cup in 2007. Argentina outscored the Barbarians by seven tries to five in the 12 try contest. Barbarians coach Cheika may have enjoyed victory with his Australia side over Argentina in a World Cup semi-final at Twickenham last month, but this time he was on the losing side against a Pumas team inspired by the brilliant Santiago Cordero. The 21-year-old left wing produced a stunning performance as the Pumas carried on from where they left off at the World Cup with an exciting brand of running rugby — precisely the kind of approach embodied by the invitational Barbarians who were marking their 125th anniversary with this non-cap international. There was a minute’s silence before this Killick Cup affair for the victims of last weekend’s Paris terror attacks as well as the late Jonah Lomu, who represented the Barbarians on four occasions. Just as the World Cup semi-finals and final at Twickenham were special southern hemisphere occasions, with no European side making it through to the last four for the first time, so too was Saturday’s match equally devoid of European players on a weekend of continental club competitions. The Pumas’ defence was cut open when Australia’s Tevita Kuridrani charged onto fly-half Lima Sopoaga’s precise low kick through before scooping the ball up for the opening try. However, it took Argentina just a couple of minutes to reply as No 8 Facundo Isa crashed over from close range for a converted try. Soon afterwards, Cordero dived over for Argentina’s second try, with fly-half Nicolas Sanchez adding the extras. Another superb break saw Cordero burst free and his sublime flicked pass to Ramiro Moyano put the full-back over for another converted try. All Blacks wing Waisake Naholo produced an impressive burst of speed and real power through the Argentina defence to grab the Barbarians’ second try. But within moments, Cordero was diving full-length to get the finishing touches to a wonderful Argentina break featuring scrum-half Martin Landajo’s chip as the Pumas crossed the Barbarians’ line for a fourth time. Replacement Emiliano Boffelli had been on the pitch for just a matter of minutes before setting Landajo racing clear for the Pumas fifth try and, moments later, centre Jeronimo de la Fuente went over as well. South Africa legend Bakkies Botha came on to a big roar from the crowd to play his final senior game following an 85-cap career with the Springboks. Botha partnered old friend Victor Matfield, his fellow 2007 World Cup-winning lock, in the second row for the last 15 minutes. Nemani Nadolo, the Fijian powerhouse who won so many new fans during his country’s exploits during the World Cup, is certainly Lomu-esque at 6ft 4in and nearly 20 stone. The giant wing, who ha the No 11 on the back of his shirt covered over in white in tribute to the All Blacks’ hero, then scored a try of which Lomu would surely have approved by running through Boffelli’s attempt at a tackle before brilliantly converting his own score. Sanchez went over for the Pumas before Matfield crashed over for the Barbarians. Rather than have the conversion taken by a recognised goal-kicker, Barbarians skipper Matfield gave Botha the chance to bow out of senior rugby with the last kick of the match. Botha ran up Jonny Wilkinson-style and the crowd roared but his kick was scuffed and bobbled short of the posts to set the seal on a hugely entertaining contest. Replacements (from): James Hanson (Melbourne Rebels & Australia), Jamie Mackintosh (Chiefs & New Zealand), Toby Smith (Melbourne Rebels & Australia), Bakkies Botha (South Africa), Jarrad Butler (Brumbies), Cobus Reinach (Sharks & South Africa), Pat Lambie (Sharks & South Africa), Francois Venter (Cheetahs), Joe Tomane (Brumbies & Australia).